Nine pieces included in Ruminate magazine! It is a deep honor to be featured in the latest issue of Ruminate magazine as the winner of the Kalos Visual Art prize. 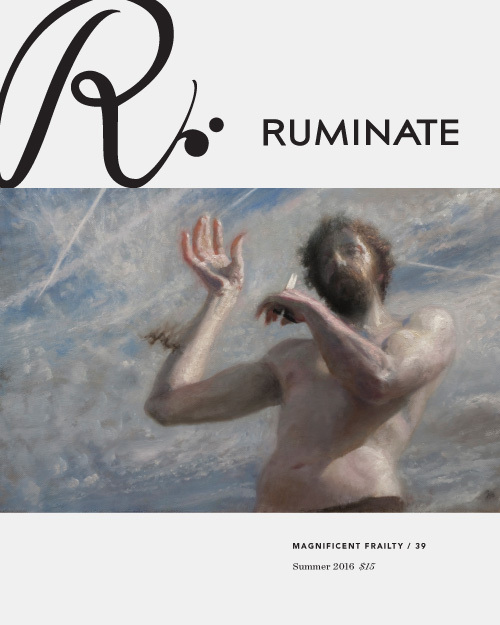 Ruminate is a beautiful, quarterly magazine that publishes poetry, short stories, visual art, essays, etc. It grew up in my tiny corner of the world - northern Colorado. My youthful fantasies conjuring up images of the sublime ferocity of Nordic Winter have been made laughable. We had green grass at Christmas. Deep winter finally reached the highlands of Östergötland, for a few weeks anyway, and I've taken the opportunity landscape painting allows to place myself in winter's midst and open the floodgates of my senses to allow it to pour into my imagination. The past days I've followed the moose paths to the engineered evergreen timber forests, and set my easel up in a clear-cut. I like the tension between the wracked, standardized, and machine-chewed marks of modern forestry against the heedless vitality of the flora and fauna that find these places perfect homes. All of it becomes hushed and pushed to an imaginative distance by washes of glittering water crystals. Hosts of metaphors and anthropomorphisms suggest themselves in that vital wasteland, and on a purely visual level, my eyes are drawn to the surprising variety of shapes and textures found there in the confluence of wild, engineered, and wrecked. Below are a few sketches from the last days. People often wonder if it is difficult to paint outdoors during the winter. It certainly is. That is, painting outdoors is always difficult, and winter is no exception. I find the only extra challenge is staying warm (which is, by the way, much easier and more conducive to painting than battlingmosquitoes on a July evening). Move: Standing or sitting still is the quickest way to get cold. If I get really cold, I sprint a few hundred meters to get the heart rate up. Sometimes I swing my arms to press the blood to my fingertips. Bring a hot drink and plenty of calorie-rich food. - Two quality base layers, and a fleece jacket. I bring a down coat in my bag and I put on when I stop walking and start painting. -Boots with a 1000 g Thinsulate, they are warm, but light enough that walking still feels natural. - For really cold days I use mittens with a detached index finger, which helps with dexterity. On those days, paint applications happens at the wrist and elbow, not at the knuckles. - Warm hat - mine is moose leather with wool lining. People often wonder if the paint freezes. I don't know at what temperature oil paint freezes but I've painted at around (-17 C) (approaching 0 F) and the paint wasn't frozen. It does get noticeably thicker when temperatures get low. I've heard other painters say that a little extra medium makes the paint manageable again. I rarely use medium though, so I just push harder with the brush, and scrape more with a palette knife.